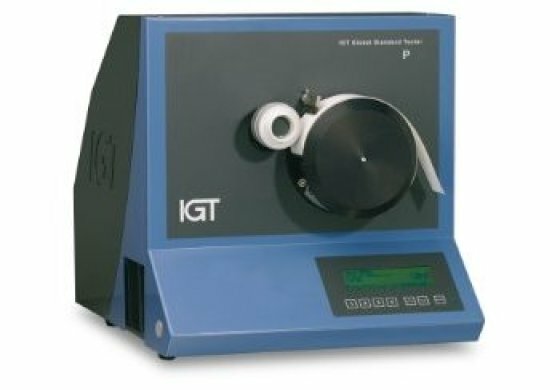 This tester is the most basic, computerized and stand alone tester from IGT, developed for pick testing only. On the basis of proven technology, this tester has been designed for daily and intensive use. Test results are fully AIC2-5 compatible. High level of reproducibility and repeatability. Ideal for users of IGT A1-3 and A2-3 testers, who are in need of up-to-date automated pick testing. The IGT Global Standard Tester P comes with an aluminium printing disc, paper packings, a sector with clamps and packing stretcher and stretching force indicator and an IGT Pick Start Viewer. Several accessories are available for this tester. Easy to use, fast operation. Long list of tests integrated. Packing stretcher with stretching force indicator. No adjustments necessary for printing discs of different diameters or different substrate thickness. Print width up to 50 mm. Printing force from 100N to 1000N. End speed adjustable from 0.5 to 4 m/s.